I present cards and little goodies for birthdays in my church office. Each person on the Worship Team has filled out a survey, stating their favorite colors, treats, etc. Today's birthday girl likes green and her birthday is close to St. Patrick's Day. Not wanting to lump the birthday in with the holiday, I chose to add a a little bit of So Saffron to this Certainly Celery and Gumball Green color palette. This little bird from Betsy's Blossoms is so sweet, decked out with Gumball Green wings! The Basic Pearl eye is watching out for those early worms! The sentiment is from the From My Heart stamp set and inked in Basic Gray. I usually make the envelope special by die cutting the birthday person's name using card stock or designer printed paper and my Timeless Type die cuts. This time I stamped the large, round flower image from Betsy's Blossoms to make my own designer paper. I stamped it onto Whisper White card stock using Certainly Celery ink. Then I simply die cut the letters out, ran them through my Xyron and adhered them to the front of the envelope. I put a tube of facial scrub (came in a green container!) into this simple white mini gift bag. The edge of the bag was scalloped using the Scallop Edge punch. I punched two holes with an office hole punch and ran a piece of Gumball Green Stitched Satin Ribbon through the hole and tied it into a bow. To decorate the bag, I used another floral circle image from Betsy's Blossoms stamp set, stamped it in Certainly Celery onto Whisper White card stock and punched it out with my 2-1/2" circle punch. In the center I stamped "for you" from Elements of Style stamp set using Gumball Green ink. I adhered the circle with Stampin' Dimensionals. I love coordinating all of my items using Stampin' Up! products. 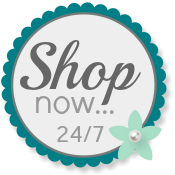 Please feel free to order YOUR Stampin' Up! using my Online Store. Exciting news! Stampin' Up! is welcoming Spring by offering some products from the upcoming 2013-2014 Catalog! Order now through May 30, 2013. 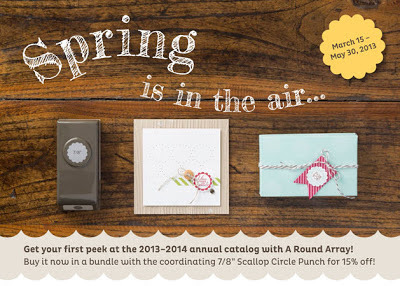 Order your Spring Surprise stamp set or bundle today, then add a few other items from your Wish List and take advantage of the Sale-A-Bration offer of one *free* item from the SAB Brochure for each $50 you order. No limits--Sale-A-Bration benefits good ONLY UNTIL MARCH 22nd!! Use my online store. Very cute! I love the bird and you always have such pretty ways to decorate the bags no matter the texture. I still can't get over the glassine bag you made. Thank you so much for sharing! Adorable card and gift bag, Patti! I love the envelope! What a great set Patti! You are going to make someone very happy! What a thoughtful idea.I love your card and gift bag.